I’m sorry for the crooked picture…sometimes I take them this way so my arm isn’t in the way and then I can edit them to flip them so it’s straight…and I am not quite there yet, I’ll figure out how to flip them. I posted about this dress a few weeks ago. I didn’t buy it when it was full price but when it went on sale plus another 40% off I was all over that! 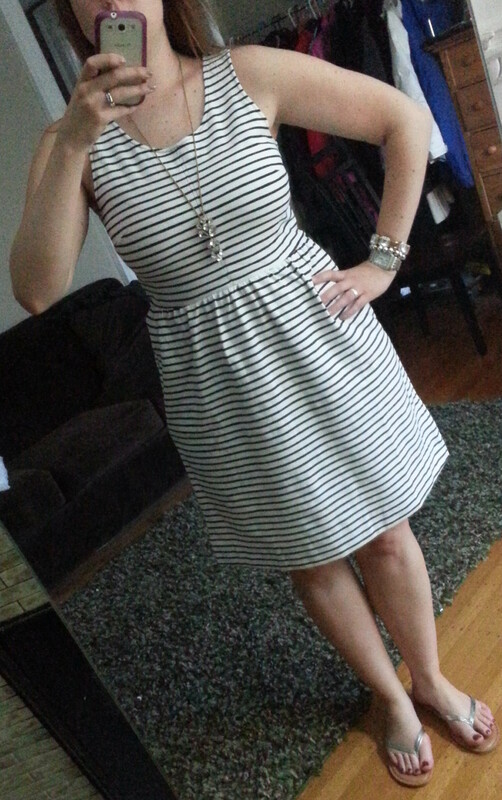 I took a size smaller than my usual J.Crew dress size so I would say it definitely runs big. For a summer dress, it hits right above my knee but it is perfect. 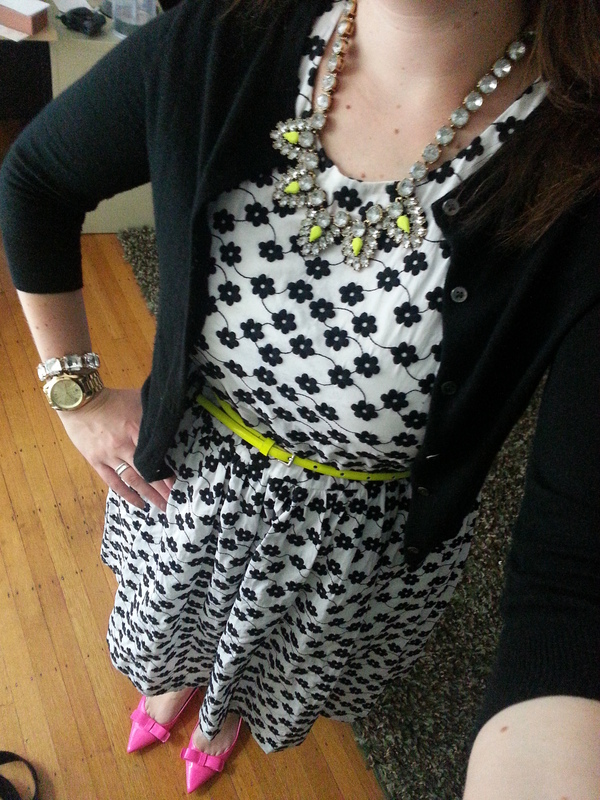 I probably wouldn’t wear it to work (maybe on a Friday) but this is a perfect weekend dress. I think a belt might help the waistline too. I was originally drawn to the top in this print but the top fit funny so, still liking the print I decided to give the dress a try. The full skirt looked promising for my hips and it also looked to be a decent length. I was a bit worried about the top due to reviews of it being a big snug. Well, it is, but I decided this was something I could live with. I do have a slight bit of pancake chest in this dress but considering I thought I would mostly wear it with a cardigan I decided I was ok with the chest issue and have made sure I wear a less padded (racerback) bra when wearing it. I really like both of these dresses because they are neutral enough that you can perk them up with some colors or keep them neutral with similar color tones. I already have a few more styling ideas for these dresses and look forward to getting more use out of them this summer. So, what do you think of these dresses? Do you have either one of them? Would love to hear what you think and thanks for visiting! I love both of those dresses! I missed that top J.Crew one. The bottom floral one with the yellow and pink is genius. Both of these dresses look great on you! I really love the racer back floral in black/white. I have the neon top version, and would’ve loved to find the dress! Enjoy!